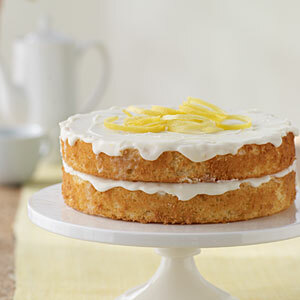 Moist and lemony, this is a family favorite. Dovetailing Tip: While juicing the lemons for the cake, juice 2-3 extra lemons and save the juice to use for Meal 4, Pan Fried Fish in Lemon Caper Sauce. 2. To prepare cake, coat 2 (8-inch) round cake pans with cooking spray; line bottoms of pans with wax paper. Coat wax paper with cooking spray. Dust pans with 2 tablespoons flour, and set aside. 3. Lightly spoon 2 cups flour into dry measuring cups, and level with a knife. Combine 2 cups flour, baking powder, baking soda, and salt, stirring with a whisk. 4. Place granulated sugar and 1/2 cup butter in a large bowl; beat with a mixer at medium speed until well blended (about 5 minutes). Add eggs, one at a time, beating well after each addition. Add flour mixture and nonfat buttermilk alternately to sugar mixture, beginning and ending with the flour mixture. Beat in 2 tablespoons lemon rind and 2 tablespoons lemon juice. 5. Pour batter into prepared pans; sharply tap pans once on counter to remove air bubbles. Bake at 350° for 32 minutes or until a wooden pick inserted in center comes out clean. Cool in pans 10 minutes on a wire rack; remove from pans. Cool completely on wire rack; remove wax paper from cake layers. 6. To prepare icing, combine powdered sugar and the remaining ingredients (except lemon rind strips) in a large bowl; stir with a whisk until smooth. Place 1 cake layer on a plate; spread half of icing on top of cake. Top with remaining cake layer. Spread remaining half of icing over top of cake. Garnish with lemon rind strips, if desired. Store cake loosely covered in the refrigerator.